Jom Classifieds -> Global Configuration -> Site display settings -> Address Auto Complete -> Yes/No -> Save. Enabling “Yes” will auto list the address suggestions related to address the user types in the post advert form. So user can quickly select the address that suggested. Enabling “No” will not suggest any address and will list only the address which is manually added. Jom Classifieds -> Global Configuration -> Site display setting -> Geo location -> Choose Yes/No -> Save. Enabling “Yes” will allow browser to track IP and when site opened will ask for track/share location for the site (Allow/Deny) allowing the location will switch the site to user current physical browsing location and list advert only in that particular shared location within the radius limit. Enabling “Block” will be default site without tracking location and no auto fill in address fields in Post advert form. Jom Classifieds -> Global Configuration -> Site display setting -> Capture location -> Choose Yes/No -> Save. Enabling Capture location “YES” will capture the user manually selected location and change the site to list capture location data (filter location based category adverts, filter location based adverts) until the section is expired. If the location is manually changed by the user then according to selected location the site will be filter. The distance provided in the radius limit is for the filtration of adverts when the location is captured by Geo location. Site captured by Geo location will display all the adverts in the radius range. 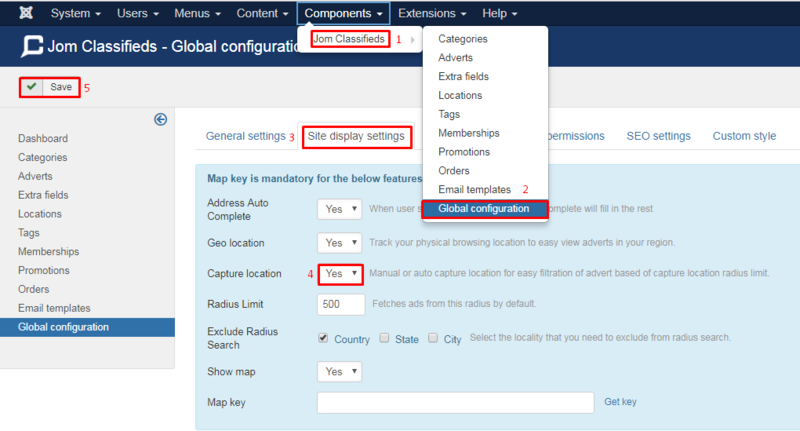 Jom Classifieds -> Global Configuration -> Site display setting -> Exclude Radius Search -> Tick the location (country/state/city) to exclude -> Save. Enabling the locations (country/state/city) will not filter the adverts by radius limit provided. Ex: If Selected “Country” then the radius feature will be disabled for country when captured by Geo location. Jom Classifieds -> Global Configuration -> Site display setting -> Show Map (Yes/No) -> Save. Enabling “Yes” will display the map is “Detailed advert view” and “Post advert form”. Enabling”No” will hide the map is “Detailed advert view” and “Post advert form”. Jom Classifieds -> Global Configuration -> Site display setting -> Map Key (Enter the Map key) -> Save. The Map key is very important for all the above features to work. Without the Map key the above feature will be inactive. Jom Classifieds -> Global configuration -> Site display setting -> Business Location (Select your business location) -> Save. Business location can be used when you are planning to do business only for a particular location (country, state). Address Auto Complete should be “Turned Off” to use this business location feature. The location which is manually added in backend location will only be listed in post advert form when provided a business location. This function will not be functionally since the capture location obtained. a. Location module has to be enabled for the capture location function. b. Enabling/Disabling Capture location in site display settings have to clear browser cache and history each time while testing purpose. Enable the location module in all pages if you need to access the location on any pages in the site. Choose the Top – position for the location module to be display for better site looking and easy accessible. 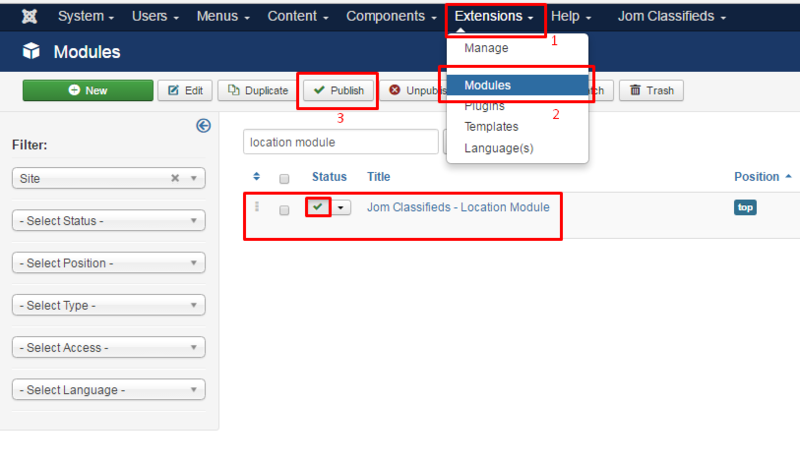 Extensions -> Modules -> Jom Classifieds – Location Module -> Module -> Position -> Top -> Save.